Should I Go to a Big or Small College? One of the main factors to consider when choosing a college is the size of its enrollment. This is one of the first things college search websites ask you to specify because it’s an easy way to eliminate a bunch of schools. But what if you aren't sure whether you’re interested in big or small colleges or what the benefits and drawbacks are for each? 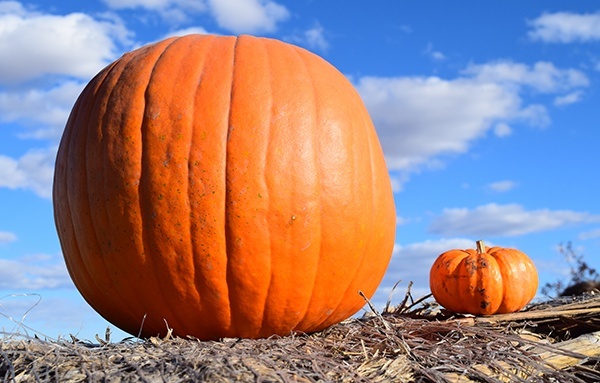 In this article, I’ll provide a rundown of the characteristics of large and small colleges and the ways they differ from one another. What Is a Big College? Schools with more than 15,000 students are usually considered "big" colleges. 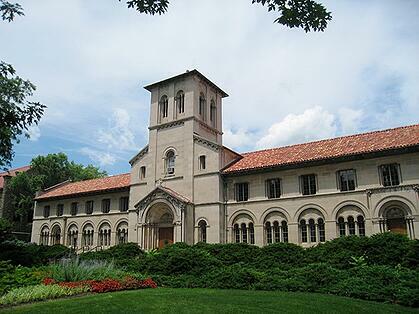 These schools offer diverse social experiences and a wide variety of learning opportunities. They are places where you'll constantly encounter new and exciting things to do and meet all different types of people. There are lots of opportunities for socializing and meeting new people. Big colleges usually have a wider selection of academic programs. There are extensive collections of research materials and state-of-the-art research facilities. There's more variety in housing choices. There will be more extracurricular clubs and activities. Big colleges have well-funded athletic programs. They often attract famous or otherwise distinguished faculty. You could end up in huge lecture classes that contain hundreds of students, resulting in less individual attention from professors. There's more administrative red tape; if you wanted to switch majors, for example, you might have to get more signatures and approvals than if you went to a small college. If you don’t speak up for your needs and interests, you could get lost in the crowd. You have to be willing to go after opportunities at a big college because no one will seek you out and give them to you. It’s more common for students to get TOO immersed in the myriad social opportunities and neglect academics. Should You Choose a Big College? A big college may or may not be right for you depending on your personality and what you’re looking to accomplish in the next four years. If you’re someone who constantly seeks out new experiences and loves meeting new people, you may thrive at a big college. You’ll have the opportunity to meet people from many different cultural backgrounds and attend a huge variety of social events. Since there are so many people, if you’re willing to explore, you're likely to find others who have the same interests as you. You’ll almost certainly find extracurricular and academic opportunities that align with your passions. If you’re interested in sports, large colleges are also more likely to have well-funded athletic programs and facilities. If you want to gain experience as a research assistant or get your start in academia, a big college might also fit well with your goals. With top-notch research facilities and distinguished faculty, large universities have all the resources you need to find these types of opportunities. If you attend a large research university, you're more likely to be presented with opportunities to collaborate on projects with professors who are leaders in their fields. This could lead to being listed as a coauthor on groudbreaking research papers or presenting research at high-profile conferences. Large universities must provide cutting edge research facilities so that their high-profile faculty can continue to make new discoveries and publish work. Undergraduates can often access these facilities and reap the benefits in their own research endeavors. In many cases, this leads to an advantage in admission to graduate school programs that value students who have already demonstrated a knack for research. If you’re an independent person who is comfortable advocating for yourself, a big college environment will probably play to your strengths. There's less individual attention and direct guidance, but if you’re willing to seek out the resources for yourself, you may have many more opportunities at your disposal than you would find at a small college. 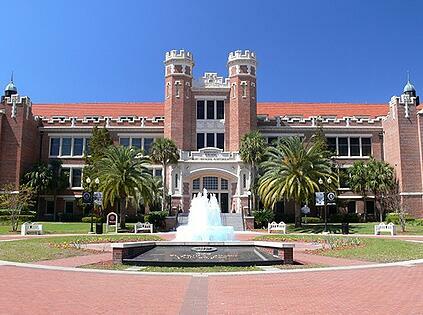 Florida State University: It looks pretty, but I can only imagine what kinds of many-legged horrors are hidden in the vegetation. Generally, a small college is defined as a school with less than 5,000 students. These schools are characterized by a close-knit student community and a greater focus on undergraduate teaching by professors. You’ll always run into people you know and will have access to more individual academic attention. You can get to know most people and will run into familiar faces everywhere you go. At small colleges, the camaraderie amongst students is often very strong. You’re likely to get more individual attention from professors and have smaller class sizes. Professors, not Teaching Assistants, teach most classes - in general, there is more of a focus on undergraduate education. There are usually opportunities to create individually designed majors rather than being stuck with the programs that are officially offered by the school. Small colleges often have stronger advising systems for students. You may have more opportunities to gain leadership experience because there will be less competition than at big schools. There are often fewer research facilities and resources. You'll find less variety in social life and less emphasis on large sporting events. There are usually fewer major choices (although as I mentioned, you can often design your own major which is pretty cool). Small colleges can be very isolating, especially in rural locations. There will be less variety in housing choices. Should YOU Choose a Small College? If you like being part of a strong community and feeling comfortable and familiar with your surroundings, a small college may work for you. Going to a small college can make meeting new people a bit easier. If you become friends with just a few of your classmates, you’ll see them around frequently, and it’s more likely that you’ll find connections with others in the community. Going to a small college makes it easier to relate directly to other students since there is a less dramatic range of experiences on campus. Did you enjoy small class discussions in high school? Did you have a close relationship with your teachers? These are both things that are more likely to be a part of the small college experience. You’ll have more interaction with your professors and get the opportunity to learn directly from them rather than being taught by TAs. Professors will get to know you on an individual basis and give thoughtful feedback on your work. You may also have more chances to collaborate with professors on research since you won't be competing with a large pools of graduate students. Additionally, curriculum at small colleges tends to be more flexible. If there's a unique academic path that you want to take that doesn't quite fit with the school's requirements, your advisors will help you make it happen. If you have more of an introverted personality and are hoping to find sustained support in college from your professors and advisors, a small college may be the right choice. What about schools that have between 5,000 and 15,000 students? These are the Goldilocks schools - not too small, not too big. If you feel that certain aspects of both large and small colleges appeal to you, you might want to look at these medium-sized schools. This is tricky, though. You could end up getting the best of both worlds or missing out on the things you liked about one or both of the other types of schools. For medium-sized colleges, it’s particularly important to look at the specifics of what the school offers in the form of research facilities, class sizes, and extracurricular opportunities. A medium-sized college may have more big college characteristics or more small college characteristics depending on its location and the composition of its student body. If the school is in a city, the social life might be more like a big college since there will be a lot going on around campus and you'll interact with more people outside the student population. On the other hand, in a rural area, you might get more of a small college sense of community and familiarity. In the next section, I’ll show you how to search for colleges by size so you can check out schools that are large, medium, and small and get a clearer picture of how they line up with your preferences. Notice that you can you can narrow your search down to schools that are the right size and also specify any other basic qualities that matter to you. 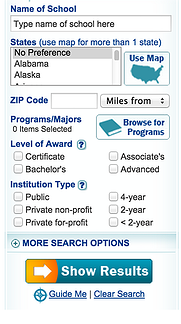 The top of the search box allows you to search for colleges by state or zip code and by program type. Once you get a list of schools, you can add any that sound promising to your “favorites” and even compare statistics side by side to see how they line up with your preferences. College Navigator will give you data about tuition, financial aid, enrollment, and admissions for the schools you choose. Once you have a good idea of which ones you like, you might consult another site to get more information about how students view the school and any other qualities you’re curious about. I would recommend Cappex, a college matchmaking site, for conducting the more in-depth part of your search since it offers both hard data and student reviews on all aspects of campus life. When you create a profile, you can specify your preferences for school enrollment size to get appropriate matches. You can also search for the schools you found on College Navigator and learn more information about them through their Cappex profiles. With these search options, you can start compiling a list of schools that you like by narrowing down your choices by size first and then figuring out if they have other features that interest you. Big and small colleges differ in the characteristics of the social scene, the resources available, and the structure of classes. Big colleges are great places for motivated students to have diverse experiences and access high-quality research materials. Small colleges are great options for students who want to learn directly from professors and gain strong ties to the community. When searching for schools, you should take these characteristics into account and decide which type of college is a better fit for you personality and goals. Here's a quick questionairre that includes some of the major points from above so that you can get a sense of whether a big or small school is right for you. If the majority of your answers are "yes", you should look into big colleges first. If the majority of your answers are "no", small colleges might be better. If the majority of your answers are "sometimes", you might look into medium-sized colleges, or size may not be as important of a factor in your college decision as it is for other people. I enjoy being exposed to unfamiliar situations and perspectives and having a wide variety of social experiences in general. I am a very independent learner. Class size is not important to me. I don't feel the need to have a close relationship with my professors. I like attending big sporting events. I'm looking for a school with extensive research facilities. I have a major in mind already. Keep in mind that not all big colleges and small colleges have the same characteristics - these are generalizations, not hard facts. Make sure you do your research to find out exactly what each school offers and how it will make your college experience worthwhile. Looking for some great resources that will help you in your college search? Read my article on the best college search websites. The Common Application makes it easy to apply to a bunch of schools without filling out a bunch of different forms. Find out which schools use it here. Aiming high in your college search? Read this article on what it takes to get into Ivy League and other highly selective schools.